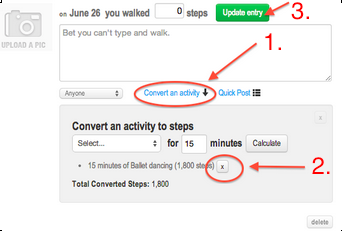 To delete the incorrect activity entry please login to your Walker Tracker web account and then scroll down to the date where the incorrect activity was posted under the Your Stats tab. 1. Click 'convert an activity'. 2. Click the small light grey [x] button next to the entry you want to delete. 3. Click the green 'update entry' button.